Discussion in 'PS3 News' started by STLcardsWS, Nov 11, 2017. Following the official announcement of the PS3Xploit news (4.81 OFW Exploit), the devs behind the project have fulfilled the promises of releasing the IDPS Dumper for OFW 4.81/4.82 as this release is ready for the public. Now there is many more things being worked surrounding the overall project but this IDPS Dumper works on all models of the PS3 (NOR and NAND, note 12 GB EMMC will be supported soon in an updated release) and no reason not to release this tool. 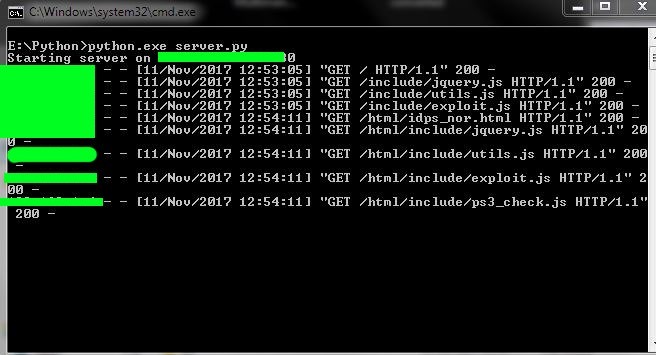 Since PS3 firmware 4.70 Sony had blocked flatz IDPS extracting tool (IDPS Stealer) and there has not been a known way to obtain the IDPS on OFW (4.70 +) consoles , but now this tool can now obtain your PS3's ID, which can have various uses, the tool has been confirmed to work on SuperSlim models by the team. . If you have not read the previous details about the PS3Xploit project, then checkout this official thread to get the firsthand information about this ambitious PS3 project. Removed all extra requirements like JQuery.. Removed the need for string relocations to improve the initial memory search process & overall trigger times. we have some more exciting news to bring you!! We have been working very hard to bring eMMC support for the newest SuperSlims CECH-40xxA, CECH-42xxA , CECH-43xxA and that has happened. The team would like to present a nice little update to the 4.81 IDPS Dumper now supporting eMMC hardware revision consoles!! Please report any issues you have while using this new version on any of the flash types, NAND, NOR, and eMMC. install python for your distribution using apt-get, yum, and similar commands. make script executable using "chmod a+x server.py" or "chmod 775 server.py" or "chmod 777 server.py"
execute python script using "/usr/bin/python $exploitFolder/server.py" or "./server.py"
I can confirm this does work if using an http server on Android. what i did was downloaded the zip (on my phone) and extracted it and then download something like Simple HTTP Server and point the server to the folder that contains index.html. once you do that just reload the server and make a note of what the ip:port is. then just go to ps3, type in ip:port (eg 192.168.2.7:12345) as specified in simple http server and then select the appropriate button for your system. enjoy this release from our team we will be working hard to add eMMC support as soon as possible!! The documentation will be updated as time goes on. There is a readme.txt file included with basic setup and usage instructions. and once again, THANK YOU to everyone involved bringing this all together, without all of you, none of this would have happened!!! "The idps dumper will create a file on usb000 then beep 3 times & shutdown in all cases, even if flash memory read fails. emmc should not make a difference to this. You will get garbage in idps.bin in that case. Js errors with a black page message on ps3 should not happen. If ever it did, just report & in the meantime keep relaunching the exploit. Nobody has had this issue in dozens of tests though. And clearing cache or cookies is totally unnecessary with the exploit & the wk js interpreter. Between runs garbage collection will take care of cleaning up what is needed, the job it does is always sufficient". Mohammed Akif, SKY1000, Metalomeus and 27 others like this. I suppose this will allow backup injection, but Google isn't cooperating. Anyone have a link on how to inject backups using your IDPS? I'm not exactly sure what sony patched post 4.70 - if it was obtaining your idps or if it has something to do with the backup procedure. there was a way to inject backups without the idps. however, if the idps was no longer needed, I tend to believe the latter is more likely. Yes, I remember the 4.70 method, but during the discussions I remember reading there was supposed to be a way to add games to 4.81 if you had your IDPS. Do you know anything about that? never heard of that. it might be possible, but I really don't know. I've never had to use the backup injection method, so I can only go based on what I've read. I normally don't like talking about things or dispensing advice if I've never done something before. ItsCosmicHD and esc0rtd3w like this. here's a pic of the server end... is there something im missing in the usb? The include and html folders are there. So im not sure. esc0rtd3w, kozarovv and Zoilus like this. Thanks @sandungas it is version specific ... i wasn't paying attention to the title... i got to excited! lol I have like 3 ps3's here i am working on and another 2001A was on 4.81 so i tried it and its working .... thanks again! esc0rtd3w, kozarovv and sandungas like this. I have the CECH-2504b 0C model, freaking fast boi, I hear people saying "took me 1 hour"
jbtheworld and esc0rtd3w like this. could have something to do with the model of ps3. yepp i got a CECH2001A and its taking the hour apparently. I did this on a 2501A and around at the 50 minute mark I just stopped the browser because I felt it was never going to end...but thats BEFORE i read people were having to wait about an hour. So its been like 30 mins already with the 2001A lets see. But dang an hour is looong. So on the 2 systems - 2501A and 2001A the process just kept going indefinitely. the 2001A I left it for 2 hours, and the 2001A for 1hr, and in my cmd window it keeps showing the process of "restarting POC" then ocassionaly I will see where it finds the offset ...then it goes back to the POC thing again and again but never finishes. everything then starts running , but never finishes. is there something im missing? from our testing, the mentioned models should work, without issues. the reason for the looping is to avoid JS errors, as the exploit will restart after failing to find any correct offset after 38 attempts. The gadget offset must be in a specific area, so many loops may happen until all needed offsets are found in their correct locations. As far as i am aware, the python server with capstone is for debugging and is not technically needed for the exploit to work. Any HTTP server should be able to serve the files. If the process does move faster, as @Jaroslav_01 mentioned , then this is good news, although i am not sure why it would be faster! Jaroslav_01 and pinky like this. Rommy667 and STLcardsWS like this. I'm not in need of a cid right now, I have a private one im using and the original cid on my cfw isnt banned. if it takes more than 5 minutes, either restart browser, reload exploit page, or restart console. I have no idea why it may take an hour on some consoles, it never took more than 5mn in all my tests. sandungas and esc0rtd3w like this.